"Cork weighs 16lb per cubic foot, water 70lb; each cubit foot of cork can carry 54lb. A pontoon made of solid cork would weigh 1,600lb, would displace 100' and could carry 5,400lb; taking away 1,000lb for the weight of the deck, made of planks and beams, leaves 4,400lb, which is enough to carry campaign vehicles. If this cork pontoon were divided into four floats, each of 25', they would each weigh 400lb and could carry 1,350lb. What advantages would come from a bridge made in this way! It could never be sunk by the impact of foreign bodies, or bad weather, or cannon fire. It would have the proper characteristics of a mechanism of war; durability, strength, and simplicity. A bridge so constructed could have one, two, three, four, five or even six floats supporting each pier, according to the number available, the width of the river and the requirement of the task. The wagons carrying the floats would no longer need to come to the river bank; such floats could be easily carried by hand for 200 or 400 yards." "Twelve pounds of cork can form a belt which fits under the armpits, which will keep a man afloat such that he can use his firearm. Several such belts, with the equivalent number of cork shoes and waterproof trousers, should be supplied to each company of pontoon sappers, to assist them in placing pontoons and to increase their security when working in the water on bridge construction." So you not only get Napoleon's comments about Caesar's campaigns, and what his enemies did, you are also treated to the master's musings on some of his own achievements. Napoleon starkly dismisses the idea that Caesar planned to make himself a king. He states rightly that "The dignity of kings was a thing to be scorned and despised: the curule chair was higher than the throne. On what throne could Caesar have sat? On that of the kings of Rome, whose authority did not extend beyond the city's outskirts? On that of the barbarian kings of Asia, who had been defeated by men with names like Fabricius, Aemilius Paulus, Scipio, Metellus, Claudius and so on? That would have been a strange course to adopt. What? would Caesar really have sought stability, greatness and respect in the crown which had been worn by Philip, Perseus, Attalus, Mithridates, Pharnaces or Ptolemy, men whom the citizens had seen dragged along behind the triumphal chariot of their conquerors?" While it is true that most of these kings were not in Roman triumphs, I understand exactly where Napoleon is heading with this diatribe. 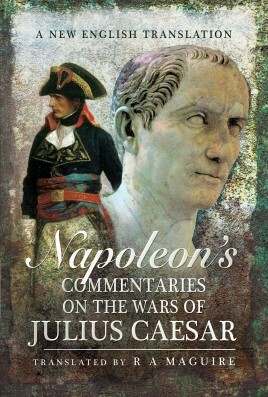 Napoleon comments many times that Caesar was very lucky at times to escape some of his battles without losing. He makes it clear that he believed Caesar to be rash, sometimes to the extreme at times. The book itself is only 119 pages long including notes. This book was last published fully in 1836. It is high time it has seen the light of day. Thank you Pen & Sword.